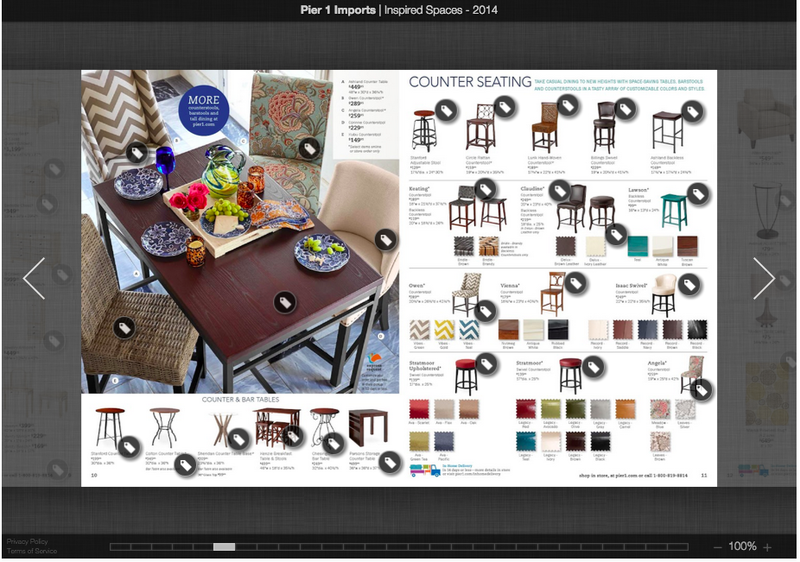 Pier 1 Imports’ Push + Pull – Cats, Chocolate + Commas. 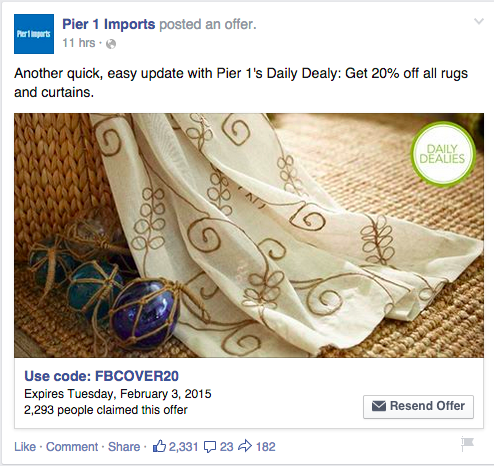 As I demonstrated in my post last week, Pier 1 Imports uses integrated marketing communication very well. The company also makes use of both push and pull marketing to stay engaged with its current customers and acquire new ones. Pier 1 has its own website to pull consumers to its stores as well as to its social media pages. The problem with the social buttons though is that the page doesn’t open in a new tab; it opens on the same webpage, which means you leave the Pier 1 Imports website. I think this is poor design because you want customers to stay on your website as well as browse your social media. In this class, we’re expected to have links open in new tabs and it seems like common sense, but I guess it’s not the norm. If you’re interested in an item, you can also share it on your social media pages — if you have Facebook, Twitter, Pinterest and Google+. Fortunately, three out of four of these buttons open in new pages. And of course in store is where a lot of push marketing takes place as well. Interacting with sales associates who can tell you what’s on sale and products that would fit your needs is a priceless form of marketing. Also at checkout, before a sales associate rings you up, he or she is prompted to ask for your phone number and email address. Pier 1 won’t call you, but we were told it was just to see where our customers are coming from based on area code. Email was captured so that customers could receive our daily emails and notifications about promotions and sales. The company also uses its social networking websites to pull in customers. 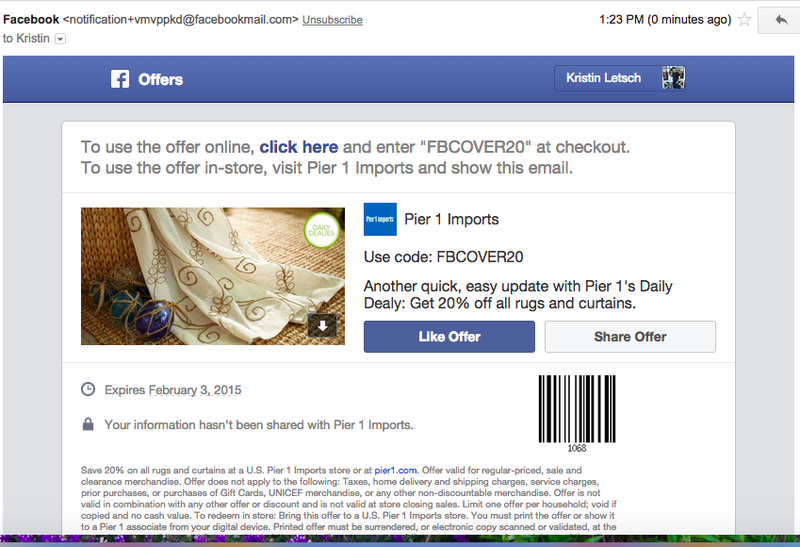 Pier 1 posts at least once a day on its Facebook and Twitter pages, providing fresh content such as company updates (the latest was the winners of its UNICEF competition) and deals for customers to use on the website and in stores. If you click on the deal, you consent to receive an email from FB via the company, instructing you how to take advantage of that offer. Below is the FB post and then the email I received when I clicked on the Get Offer button. It’s funny: Facebook knows my recent search history because when I first signed onto FB this morning, Pier 1 was one of the first ads that came up. Crazy. Social media is great for WOMM — it’s priceless and easy — because consumers can be your spokespeople (albeit potentially your worst enemies too). They can refer your company to their friends and tell them about their great experience with your company. 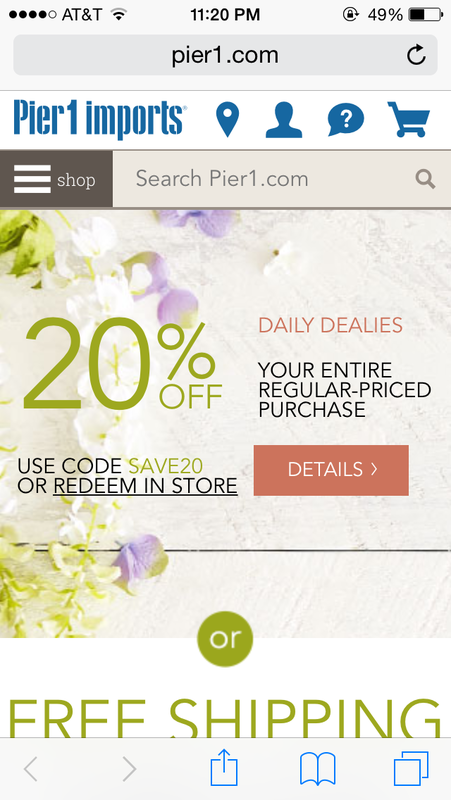 Pier 1 does not have a blog, but it is mobile friendly. Surprisingly, the company doesn’t have its own app, and the CEO did not include an app in the company’s improvements. The mobile site is fairly easy to use though. The main buttons at the top allow you to find your closest Pier 1, create an account or sign into your current one, contact the company, and edit your basket or checkout. These are all functions that would ultimately result in a push technique. You can also view the desktop site, but I find the mobile site easier to navigate with such a small screen. If you do want to use the desktop site, a push notification comes up asking you to enter your email address to subscribe to Pier 1 emails. One thing I found amiss about the mobile site is that on the homepage, there are no social buttons. Only when you clicked on a specific item were there social buttons to share on your SNS. I think Pier 1 should continue to send out mailers and advertise on TV and radio. A majority of Pier 1 consumers are older women and, although this demographic is now logged on, I think the best way to reach them is still through traditional media. And then of course, social media is a great way to reach the younger demographic, especially with posts that offer deals. Pier 1 does do a great job of maintaining a consistent image across all media, but it should work on its message, as I have explained above. We saw in lecture this week that Amazon and Target do a great job of maintaining their brands; we would recognize the logo anywhere (Rhoads, 2015). Pier 1 has a much smaller market, but I think maintains its brand well so that its consumers know that an advertisement is from Pier 1. 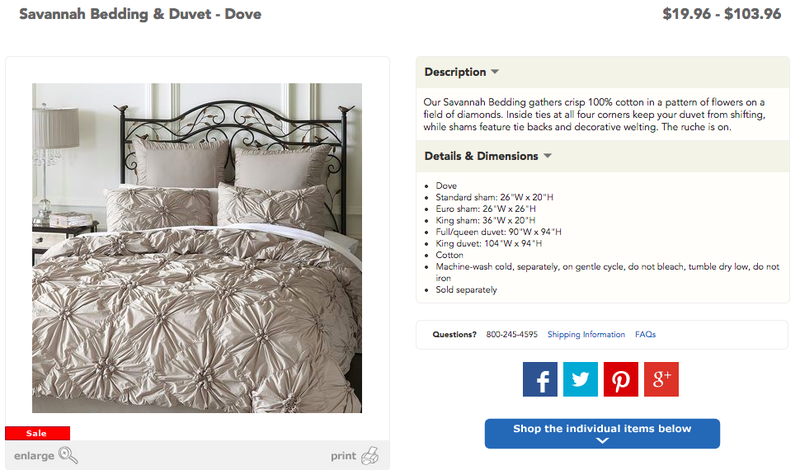 The problems I found with Pier 1 online tended to be with its social media: the pages didn’t open into new tabs and the mobile site didn’t have social buttons on the homepage. The mobile site is still relatively new and I’m sure will improve as time passes once the company analyzes its performance, but those social buttons should be present. On its website, making the SNS open into new tabs is an easy, but necessary fix to keep customers on your page. Once they’re on FB, Twitter or any of the other sites, you’ve lost them.